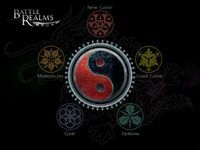 Powerful samurai and brave monks face off barbarians, evil magicians and deadly ninja in Battle Realms, Liquid's first real-time strategy game. Set in a world of magic and combat, Battle Realms puts the focus where it belongs - on the battlefield! · A living world - birds fly out of the trees as your warriors pass beneath, wolves stalk unwary soldiers, and wild horses gallop across the plains. Fire rages and spreads through a village as peasants desperately bring water from a nearby river. · A fully 3D world - dense forests, rugged cliffs, sandy beaches, terraced rice fields, crashing waterfalls, and more.